Watching this video, Small wonders: What ants can teach us, left me with the visceral feeling that we’re simply ants with big brains and hands with opposable thumbs. Certainly, this comes close to chapter 56’s This is known as mysterious sameness! Just imagine what ants could do if they had these two assets, big brains and hands. I suppose they would ruin the earth even faster than we are doing. With behavior this “human-like,” they must be pretty smart, right? 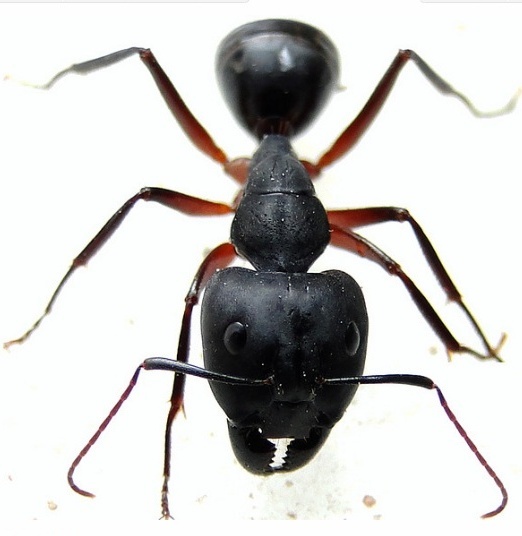 No, according to Deborah Gordon, professor of biology at Stanford: “Ants are not smart. In fact, if you watch an ant for any length of time, you’re gonna end up wanting to help it, because ants are really very inept. “But colonies are smart. So what’s amazing about ants is that in the aggregate, all of these inept creatures accomplish amazing feats as colonies,” she said. 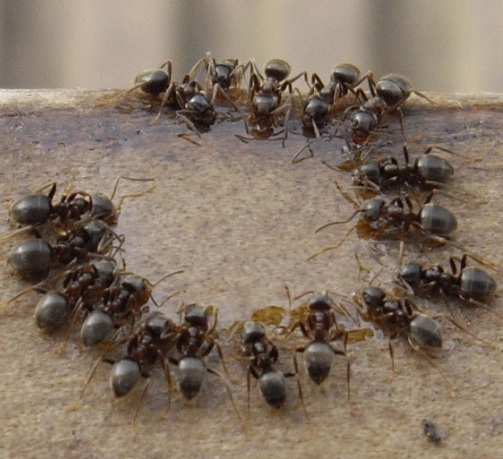 “In an ant colony, there’s nobody in charge. There are no bureaucrats. There are no foremen. There are no managers. There is nobody telling anybody what to do,” she said. So all these survive and thrive together, all without a leader – which can be hard for us humans to understand. 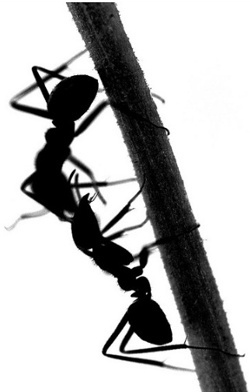 Most ants, it turns out, simply “follow the crowd”; the more ants follow a trail, the stronger the trail’s scent is – and the stronger the trail’s scent is, the more likely ant will follow it. Our belief in free will induces us to think we have more control over life than we actually do. What’s more, if we aren’t, at least someone is… for better or worse. History and science hints at just the opposite. Our biology in general and instinct in particular are the ones really in charge, just like in ants and every other living thing. I just can’t remind myself of this fact too often. The yearning (1) to see ‘Superman’ in the mind’s mirror is just that compelling. Finally, notice how well chapter 71 has humanity pegged: Not to know yet to think that one knows will lead to difficulty. While we’re never going to reach that simple naturalness known to other animals and plants, we can at least take heed, as the first line of chapter 71 advises, To know yet to think that one does not know is best. (1) This yearning is an inevitable result of the survival instinct’s effect on a large thinking brain. The need to be in control is a primal sense we share with all life, or at least, all life with a developed nervous system. In humans, emotions drive cognition to think up appealing scenarios that agree with that innate emotion, and voilà! … We have cultural narratives that offer us the evidence of our special place in creation. In short, we judge ourselves and unsurprisingly come out on top. Perhaps we are referring to different NOWs. In my ‘now’, I find it impossible to stipulate the state of other people’s NOW. It is only outside my ‘now’ that I’m able to speculate on other people’s NOW. Then, unless my view is impartial in ever respect, all I really see is a projection of my own desires and worries. Take the idea if duality for example. The animal sense of ‘fight’ or ‘flight’ is an emotional duality, as is hunger or satiated, aroused or sleepy, and so on. These emotions stir the brain’s grey matter, which we happen to experience as thought (along with and backed up by the originating emotion of course). I am not convinced that there is much difference between us and other animals. If anything, I figure we do not fully know(1) the animal we are. Ah, but then what animal does? The sameness is truly mysterious. (1) I use the word “know” hesitantly, along the lines of chapter 71: To know yet to think that one does not know is best; Not to know yet to think that one knows will lead to difficulty. The image we have of ourselves is a projection of our desires and worries (needs and fears). It is a ideal based more about what we want to be than what we actually are… our original self so to speak. This disconnect may cause us to be a bit emotionally unstable. When I visited Kenya and went on the animal safaris, biology/ nature where quite evident. When you watch a leopard, cheetah or lion hunt, it is quite obvious they are in the NOW, and the animal fighting for its life force is in the Now. It is sad that a lot of people do not experience the NOW, they are either in the Past or the Future. What is really sad is when we separate ourselves from nature and spirituality. I look at spirituality as the aroma of nature they are one. There is no duality. Related to free will or lack thereof, have you seen this article? Read the article linked in there as well. I hope all of you that are in “TAO Land” are enjoying the NOW!